Stop: It is Red Signal! Where there is traffic, we need a signal. Yes, the real- life director shows that everyone has to stop at a signal. About 20 to 25 people start their businesses who are however, the causes behind the snarl up in someway or the other. They often fool the traffic. This is how the financial capital of the country breaths its every second. The film shows that like the Government, the underworld too collects its 'tax'. It also has a hierarchy. Ironically, it exemplifies the biblical concept of "Live & Let Live". The young characters have spoken volumes in their silent and instinctive looks. The film gets its pace with incidents in the first half followed by the consequences after interval. These sequences are from the Bhandarkar triology of Chandini Bar, Page 3 & Corporate. The film satisfies the 'cause & effect' phenomenon in fields like corruption (but still honesty thrives somewhere & thus pays for it), prostitution, homosexuality and policy- making (the age- old marketing strategy experienced by today's management gurus). It also deals with the corruption in tsunami rehabilitation fund, advertisement and branding (a common man's reaction to a non- effective fairness cream) and the infidelity factor in extra- marital affairs, thus leading to re- divorces. In the process, a silent love story which develops in the characters of Konkana Sen Sharma and Arjun (Ranvir Shorey), a fake software engineer who speaks English gets noticed by Konkana and the audience only when Arjun is dead. Silisila (Kunal Khemu) and Rani (Neetu Chandra), are a part of a successful love story in the movie. The Jiya Dhadak Dhadak guy with his new rugged look has given a threshold to his career. Neetu Chandra, a new- comer has done her bit with ease and talkative eyes. The film has done equal treatment with almost every character. The tsunami boy in Traffic Signal still has a ray of hope for his parents who are dead actually. Incidentally, the film has no such songs like a title track, romantic number but has an item number. The background song by Hariharan is quite apt, whose lyrics also coincides with the lives portrayed. 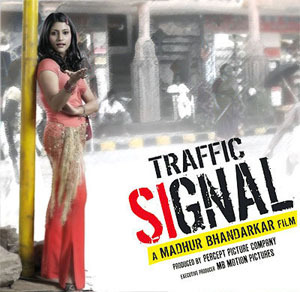 The climactic point is the destruction of the traffic signal as the film starts with a red signal and ends in a fused signal. It is not a semi- biographical movie; rather it's me, you and the man next to you at the traffic signal. Thus go and have a different taste!!! !